If you’re familiar with sports betting in general, or have already bet NHL hockey, this article is perfect for you. Many of our friends have always done their hockey betting by using provincial sports lotteries like Pro-Line, Sport Select, Oddset, Mise-O-Jeu and Sports Action. They were surprised to learn that betting hockey online is so much better than doing Proline hockey betting or Sport Select. Doing Proline betting is basically lighting money on fire, the Proline hockey odds are that bad. Plus betting hockey online allows you to bet one game at a time. However, it can be scary when you think about doing betting online. You’re not sure how it works, who to trust or how to get started. That’s what this Beginner’s Guide To Betting NHL Online is all about – to help you, answer your questions and eliminate your fears. Online NHL betting odds are similar to Vegas NHL betting odds, based on a -110 price structure. This means that if two teams are evenly matched on the NHL betting odds, you’d have to bet $110 to win $100. If you win one and lose one, the extra $10 goes to the bookie as a “commission”. However, Proline hockey odds and Sport Select hockey odds are generally on a -130 price structure or higher. Instead of betting $110 to win $100, you’re now risking $130. And the difference in odds quickly adds up when you have to parlay your NHL hockey bets, which Proline requires you to do. See for yourself. Go check out the NHL betting odds at Sports Interaction. 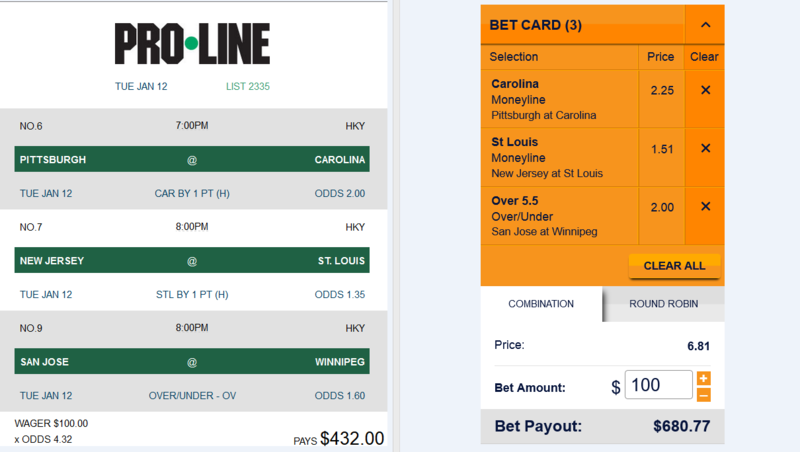 Compare them to the Proline hockey odds and Sport Select hockey odds. Not only will you see a huge difference, you’ll also see a lot more betting options. Proline and Sport Select require you to combine several outcomes (usually a minimum of three) on all your NHL hockey bets. Betting hockey online, you can bet one game at a time. And if you still want to bet a parlay, you’ll get way better odds. Just think of better odds x better odds x better odds. That equals a lot more money in your pocket. If you don’t have to parlay, you’ll make money with a 2-1 night. Get two of three right on your Proline hockey bet and you’ll lose all your money. Proline, Sport Select, Mise-O-Jeu and other provincial sports lotteries are slowly adding online features, but online NHL betting is still much more convenient. Everything is doable from your couch – bet online, research your NHL betting picks, find free NHL betting tips and more. Whether it’s on your laptop or on your smartphone, all these NHL betting options are available at your fingertips, rather than having to walk down to the corner store. Online sportsbooks like Bet365, Sports Interaction, Bodog, William Hill and Bet Online will give you a signup bonus on your first deposit, allowing you to double your money instantly. When’s the last time the government gave you anything for free? Online sportsbooks also offer reward programs, giving you free bets and/or bonuses to say thank you for your business. The only reward we’ve ever seen from Proline is entering your losing ticket into a huge random draw for some crappy prizes. We could go on and on, but those are the 4 big reasons to do your NHL betting online. Now, here’s the big reason a lot of people are reluctant to do online hockey betting: they don’t trust it. There are horror stories out there about sportsbooks that rip people off. There are also bad stories out there about hotel rooms, but will that keep you from ever renting a hotel room again? If you use only the most reputable and trustworthy sportsbooks, those horror stories won’t happen to you. Sportsbooks like Bet365 and William Hill are regulated in the United Kingdom. Some of them are even listed on the London Stock Exchange! The sportsbooks we recommend have rock-solid payout histories and excellent funding methods. We’ve bet with all of them for 10 years (yes, we’re members at all of them, since they often offer different odds and we just pick the best) and have never had an issue. Stick with our recommended sportsbooks, and you won’t have to wonder ‘are online sportsbooks safe’ anymore. This is the other main reason you may be hesitant to do online NHL betting: you’re wondering are online sportsbooks legal or not. Ultimately, the answer depends on where you live. We live in Canada, where it is not illegal to use online sportsbooks, and a lot of other countries have similar laws. In the United States, there’s been a recent crackdown on poker and online gambling, but several sportsbooks still cater to U.S. customers and we know many Americans who do online betting without fear of legal action. We wrote an article that addresses the ‘Are online sportsbooks legal?’ question a bit more. This process varies a bit by sportsbooks, but it’s almost always easy. The first step is to sign up for a sportsbook. If this is your first sportsbook, we recommend Pinnacle Sports (best odds) or Bet365 (best bonus) to get you started. Bodog (Bovada for Americans) is also a good choice since they accept deposits via Interac email transfer, just in case your credit card isn’t accepted. Once you’ve registered and logged in, you should see a link to make a deposit. Click on that and then choose which way you want to fund your account. Credit cards are generally the easiest, but some banks won’t allow you to fund online betting accounts with them. If that’s the case, there are e-wallets and other deposit options you can use. Check out our article on the different deposit options offered by each sportsbook for more information. This is similar to depositing, but you click on the Withdraw link instead of Deposit. Again, your options will vary by sportsbook, but most of them offer either a cheque or a bank wire. If you need the money quickly, you should be able to get express options on either, or try withdrawing to an e-wallet instead. Even when we narrow it down to the best online sportsbooks, there are still a lot of places you can do your online NHL betting. If you can’t wait to get started, why not try Bodog right now? It’s a sportsbook founded by a Canadian (Calvin Ayre), offers a nice signup bonus and has good deposit options. They also have tons of fun betting props, fast withdrawals, great customer support and a flashy new interface. If you plan to do most of your betting on your smartphone, however, you might want to go with Bet365 (www.bet365.com) instead. The Bet365 app is the best we’ve seen for mobile betting, and they’ll even give you a bonus for your first mobile bet. If you’re an American, Bovada.lv is the first place you should play for the same reasons as Bodog (they’re practically the same, but cater to different countries). Doing NHL betting online might seem intimidating at first, but it’s really quite easy. Visit www.Bodog.eu and sign up/log in/deposit. In the dropdown menu in the top-left corner of the page, select Sports. Open that dropdown menu and select Hockey. This should bring up a list of the best games on the betting board. If you want to see them all, click on ‘View All’ at the bottom of the screen. Click on the outcome you want to bet on. For a NHL game tonight, you can click on Spread, Moneyline or Total. (For an explanation of these terms, visit our Betting Glossary) As an example, we’ll click on Dallas Stars -180 under Moneyline. The Dallas Stars -180 Moneyline should now be listed in your Bet Slip in the top-right corner of the page. Input either the amount you’d like to Risk or the amount you’d like to Win. The other field should automatically fill in so you can tell what you stand to win or risk. Click on Review Bets. If everything looks right to you, click Place Bets. That’s it! You just made your first online NHL betting pick! If you have any questions, shoot us an email. We’ve seen too many of our friends lose more money than they should have playing Proline, and we’re happy to help. Otherwise, get over to Bodog, Bet365 or any of the other best NHL sportsbooks and get started on NHL online betting!